Olallie Mountain had been on my list for quite some time and I finally made it. Unfortunately, though, several weeks after this hike, the Rebel Fire set up camp below Olallie Mountain so I'm not likely to return there in the near future. 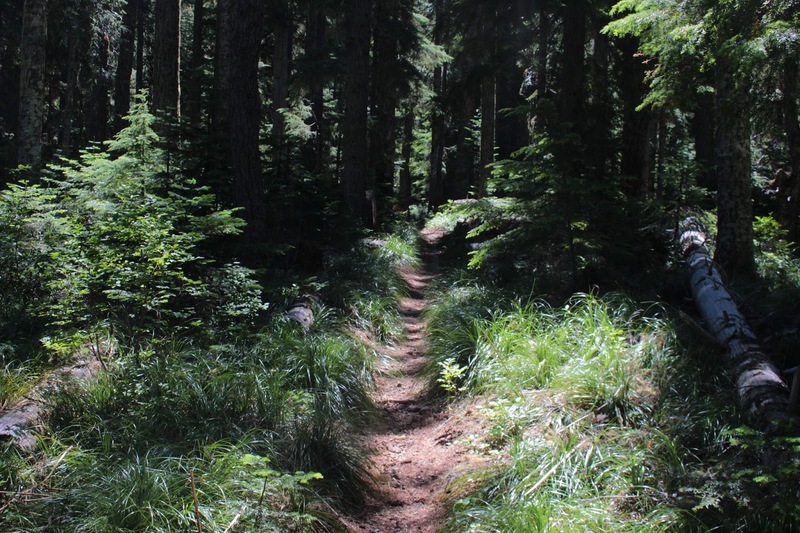 At the time of this writing, I'm not sure whether there will be any shady forest left on the Olallie Trail after the fire, either. 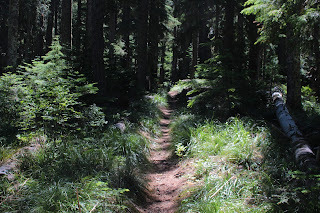 It would really be a shame if the fire overran the Olallie Trail, because the lush vegetation and deep shade were some of the main attractions on this green hike. But at least I made it before fire season began in earnest in Oregon. 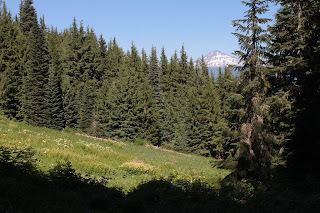 Accompanied by trusty canine friend Luna, I set out upon the Olallie Trail and entered the Three Sisters Wilderness almost immediately upon leaving the trailhead. 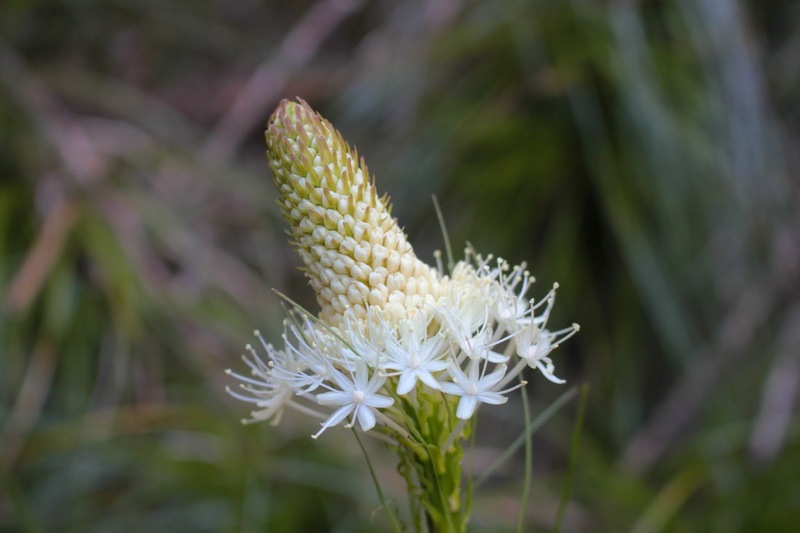 The Olallie Trail pokes into a corner of the wilderness on the western border, so the Three Sisters were fairly far away despite our hiking in the namesake wilderness. 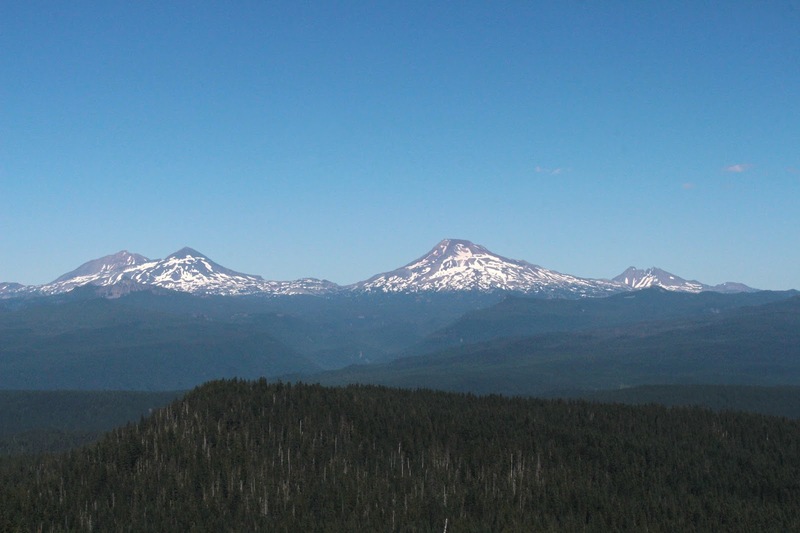 As a result, the Three Sisters would be pretty much a non-factor on the lower (and forested) section of this hike. The tree cover was as thick and lush as a young man's mane, and the shade dark as a teenager's mood, but a whole lot more pleasant to be around. Spring was definitely going on, and I spent a lot of time low to the ground, sometimes lying on it (while a dog licked my ear) taking pictures of bunchberry, wild ginger, coneflower, penstemon, Columbia windflower, and goat's beard. And speaking of goat's beard, I probably should shave soon. The trail angled steadily uphill through the forest before crossing a small creek in just under a mile. Intrepid bushwhackers can follow this stream to its source at Wolverine Lake. However, I was expecting a clearer route; the hillside was covered with thick vegetation and fallen trees and while Luna was not averse to a good bushwhack, I wasn't in the mood, so we kept hiking on the Olallie Trail. And now a word about the weather. On the drive up, there was a chill in the morning air and geese were flying south in their traditional "V" formation. In sunny exposed areas along the roadway, vine maples were showing their first autumn blush. Winter is coming. But not so fast, Richard, by mid-afternoon, the oppressive heat had taken care of all that winter chill. While the forest was shady, it was fairly warm despite the shade. 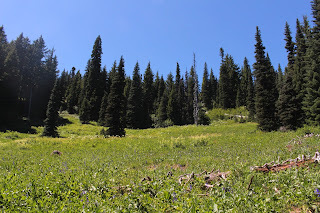 Meadows were worse, where the sun baked both dog and hiker noggins. The stultifying heat had us both panting to keep cool, while the humidity had us all sopping wet in short order. Note to self: don't wear a black shirt when it's hot and humid like that. 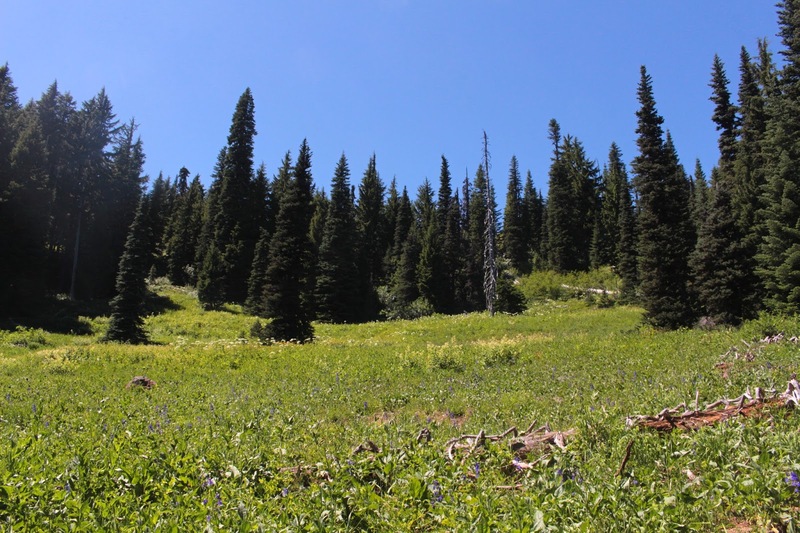 From the junction with the Olallie Trail and the Olallie Mountain Trail, it was all meadow and it was all uphill, too. 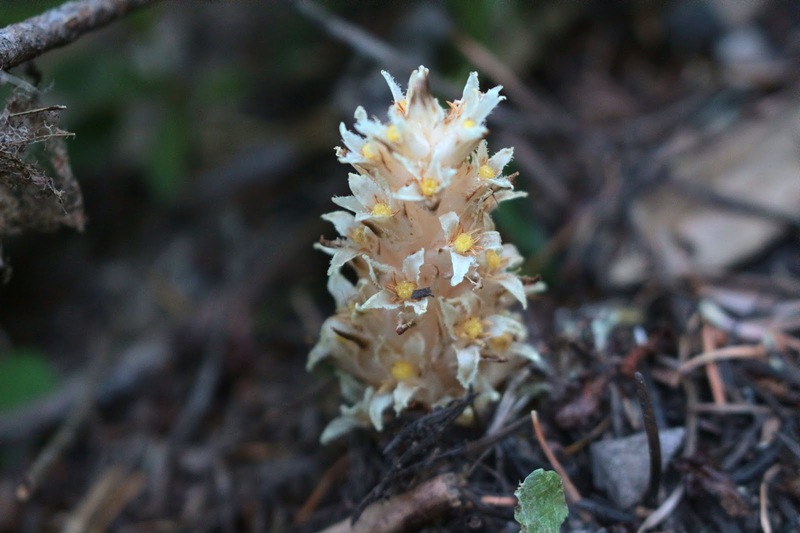 I bonked, and it was a slow trudge for the remaining mile or so to the Olallie Mountain summit. 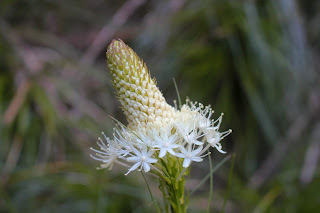 Gone were all the shade loving flowers but on the plus side, I got to take pictures of sun-loving beargrass, Washington lily, lupine, and Indian paintbrush. 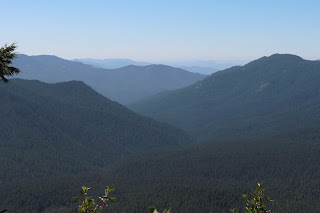 One last steep push delivered us to the Olallie summit where an old lookout and prodigious views were our reward for all the hard work. 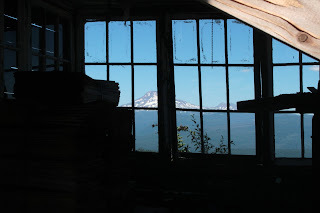 And best of all, the rustic and dilapidated lookout provided shade on one side, so we plopped down and enjoyed the expansive panorama before us. 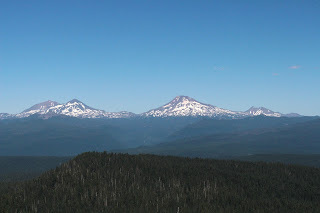 The Three Sisters were directly to the east and easily dominated the view. North of the volcanic sisterhood was Mount Washington, Three-Fingered Jack, and snowy Mount Jefferson. In the haze to the south, Mount Thielsen was barely visible. 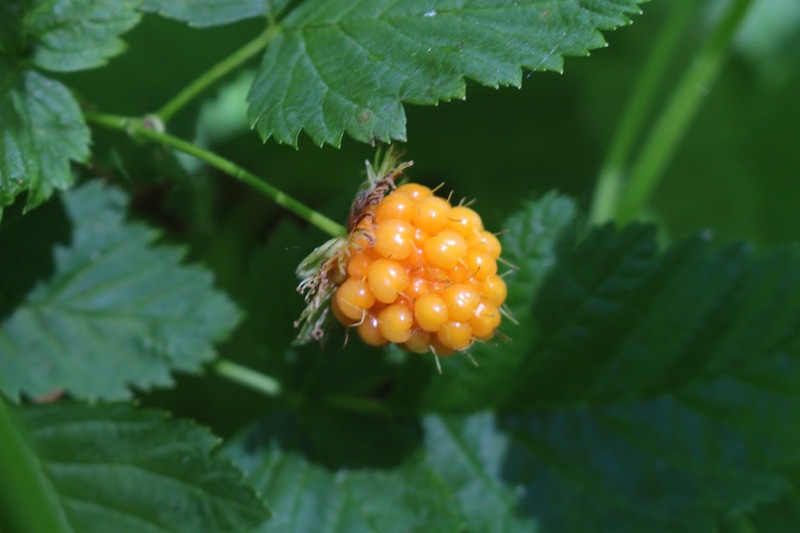 On the west side of Olallie Mountain, the valleys and canyons of Rebel Creek and French Pete Creek dropped off into the South Fork McKenzie River, all winding up in the prominent McKenzie River valley. In the distance, were the faint blue ridges of the Coast Range. Pretty awesome view, if I do say so myself. After a lengthy lunch, view-soak, and photo-shoot combo, we reluctantly left the summit and headed back down the trail. On the way down, we ran into another hiker who had one of Luna's kind with him, much to the enjoyment of both our dogs. He had just done a PCT section hike and was looking to hike the trail around the mountain. Unfortunately he had to give that idea up, stating the Olallie Trail, just past the junction, was pretty much lost to the vegetation. 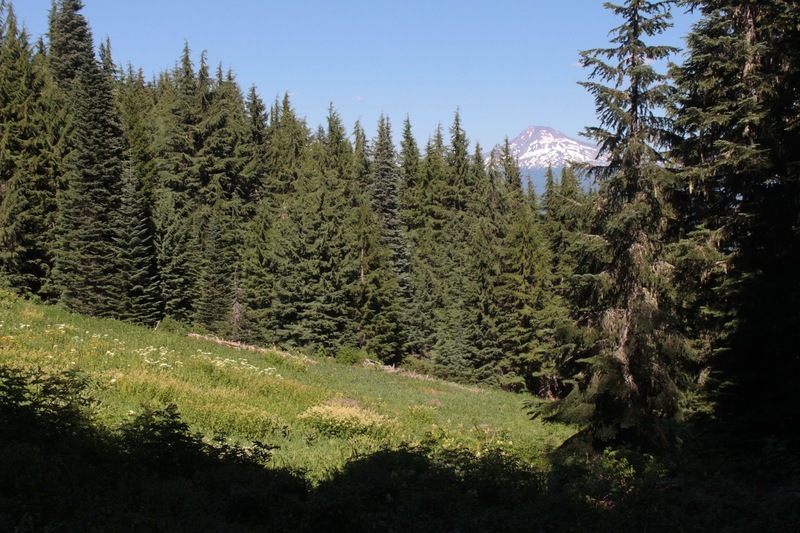 Of course, the following week, the Willamette National Forest posted an announcement that they had finished brushing out the Olallie Trail. And of course, a week later, the Rebel Fire set up camp for the remainder of the summer. I guess my timing was both good and bad for this hike, but at least my very lengthy list became one hike smaller.